Jamo R907 review | What Hi-Fi? Speakers don't have to come in wooden boxes, as Jamo proves with the mighty R907. A drive unit throws out the same amount of sound backwards as it does forwards and the box is there to stop the two interfering. This interference cancels bass, leaving the sound thin and overly bright. Why build the box out of wood? Well, it's cheap and easy to work with. Jamo took a different approach with its R909 speakers, and it follows the cabinetless route here. While it's true the cabinet prevents bass cancellation, it also introduces a whole range of distortions that every speaker with an enclosure suffers from to some degree. Ever touched the side of your speakers when playing something at high volumes? The vibration you feel is the cabinet making a sound, and that sound is added to the drive-unit output. Making the cabinet rigid, changing to a curved shape or using fancy materials changes the enclosure sound, and may even reduce the level, but it never totally gets rid of the problem. The only way to do that is to get rid of the cabinet, so that's what Jamo has done. The R907 uses a 43mm-thick MDF front baffle to mount the drive units and a 23kg cast-iron base to keep the structure stable. To compensate for the bass cancellation, the engineers have used the wrecking-ball solution of two 38cm bass drivers per side. In a cabinet, these would produce enough bass to annoy not just your direct neighbours but the entire street; in a cabinet-free design, the results are balanced. You'll need a large room to get these speakers to work well. Try the R907s in a room smaller than around 4.5m in length and breadth and all you'll get is a sea of ill-defined bass. These are dipole speakers, firing the same amount of sound backwards as forward, so positioning is crucial. Try a metre away from the wall with a toe-in towards the listening position. Get it right and you'll get a stable, layered stereo image, and a really big soundstage, with the rearward sound reflecting off the walls to add an impressive sense of space, without spoiling image precision. The tonal balance is slightly rounded at the top end and there's an appealing richness to the midrange. Get past this – and you can easily – and you have a large-scale sound that's very easy to listen to at length. Most impressive is the speakers' articulation. Notes stop and start with rare precision, making conventional alternatives sound blurred in comparison. The balance between those bass units, the magnesium-coned midrange and decoupled dome tweeter is superbly judged, making the presentation seamless and consistent right across the frequency range. These speakers thrill with large-scale classical works such as The Dark Knight OST. 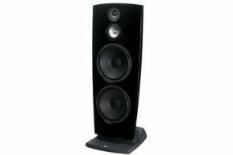 Dynamics are first rate and the speakers' unusually articulate low frequencies come to the fore. Few rivals render bass with such texture, subtlety and force. Move to Kanye West's 808s and Heartbreak and the Jamos continue to impress with decent timing and pleasing combination of attack and refinement. Jamo has taken an innovative approach to speaker design here, and it has paid off. The R907s aren't perfect but they do things that conventional rivals can't. Provided your room and system are up to scratch these are highly recommended.